I mean, it sort of has to be on here, doesn’t it? Unlike everything else I’m putting on this list, even the Witcher 3, there’s going to be some controversy as to whether or not it’s worthy of a top 5 list. Especially my Game of the Year. However, It’s difficult to understand why anyone could deny that Super Mario Maker, a practically bottomless well of unique, interesting and outright insane Mario levels wouldn’t deserve to be on this list. It’s Mario. Nintendo packaged the best parts of Mario and let the community do (almost) whatever it wanted to with it, and the community ran wild. First, just the sheer scope of this game is worth of praise. Yes, there are fan hacks and level editors on the Internet, and they’ve existed for decades, and some of them may have better tools than this one, but that’s not the point. The fact that Nintendo would release these tools to the public and allow anyone with a Wii U to go nuts and live out their desire to be Shigeru Miyamoto is amazing. Then, to present the game with such clean visuals, an excellent and well designed user interface and continued support, it’s just phenomenal. In the package, there’s nothing wrong here. Sure, it could probably use more stuff, and the fact that every generation runs on a modified version of the New Super Mario Bros. U physics is slightly disappointing, these are minor problems, at worst, and in practice, are minor nuisances. Mario handles great, better than he did in Super Mario Bros. U, in fact, and the switch to other generations is hardly noticeable, except in the most extreme cases. Then, when it comes to actually building a level, Nintendo has done everything they can to make the process as painless as possible. In a lot of ways, it’s similar to Minecraft, or Lego. It may not be as in depth as some other level editors, but it does allow for anyone to jump in and work on what they want, how they want to, thanks to such an easy to use process of level construction. Nintendo puts all their tools right out in the open, and makes it so they’re easy to access, and does a really good job of teaching new players how to use these tools, even the ones that are slightly less intuitive than others. Even the limitations are, in some ways, a strength, since it allows for a lot of designers to come up with inventive solutions, in many cases, strengthening their levels. I’m a big proponent of utilizing the tools to go outside the intended scope, and using limitations as a means to be even more creative, and the community as risen to the challenge. There are so many levels that are more than just Mario levels, or worse, Kaizo Mario or Auto Mario rip offs. I’ve seen Zelda games, Sonic levels and Metroid maps. I even saw some guy turn a level into a working calculator. That is absolutely insane. Even more, Nintendo continues to support the game, adding more and more tools and ideas every day. Sure, things aren’t perfect. Unlocking things, and the Amiibo functionality, aren’t exactly great, or fun, especially attempting 100 Mario games, and it apparently used to be worse before I got my copy (something like almost 20 days just to have all of the level editing features? Lame), but now we’re starting to see things level off and it’s becoming pure creativity. So far, I’ve only seen two real downsides, and they do sort of play into each other. First, not everyone is going to be a talented level designer, and that does mean there are going to be a lot of bad levels. Worse, because of how hyper competitive video game communities tend to be, curating the experience is currently a nightmare, with the most popular and well known levels being more about difficulty, which is often arbitrary instead of skill based, rather than creativity. There are some truly challenging and good levels out there, but there’s also a lot of stuff that’s trying to rip off things like I Want to be the Guy, with difficulty being more about rote memorization rather than skill. Related to this, the other problem is that the game is intimidating as Hell. Yes, Nintendo has removed a lot of barriers to entry, but some still exist, and a lot of them are somewhat psychological. Full disclosure, I have not completed or submitted a level of my own yet. I’ve played a bunch of fan made ones, plus a bunch that come pre-loaded on the disc, but I haven’t been able to finish one of my own. Part of this is that I’m a grown man with a full time job and papers to grade, and I keep thinking World of Warcraft will be good to me this time around, but another part is that it’s scary. There’s a lot going on, and I want to make a good level. Still, that’s just me, and not a reflection of the game. The tools themselves are nice, but they do scare me. Still, it’s some of the best Mario I’ve ever played, and it might just be the gift that keeps on giving. Sail on Nintendo, you crazy bastards. Sail on. This is something I’ve had cooking in my brain for the past couple of years, but I’ve been uncertain as to whether or not it’s a good idea. Game Anatomy is where I break down really good examples of Game Design, showing where things went right, where things could have gone better, and where things may have also gone wrong. It’s sort of like Egoraptor’s Mega Man Sequelitis, but I’m going to focus entirely on the good aspects of game design. I will be comparing the things I choose to similar things, but I’m mostly going to focus on a single thing. This time we’re going to look at one of the most important levels in video games, World 1-1 in Super Mario Bros.
Obviously, Super Mario Bros. is one of the most important games ever made, and what’s shown in that picture above is pretty much the reason why. Sure, while SMB isn’t the first scrolling platformer, nor is it the first game where Shigeru Miyamoto got a chance to show his genius, but it is the first time both of these things came together and everything worked out so amazingly. In the picture above, it’s showing the first, maybe 5 seconds of the game, and these five seconds are completely brilliant. They teach the player nearly everything they need to know about how to play the game right there. This part of the game is so good, I actually use it in my classroom to explain how to learn. So, those five seconds teach the player how to fight, what hurts, coins, question blocks, bricks and power ups. That goomba alone, will teach the player about half of that stuff right there. 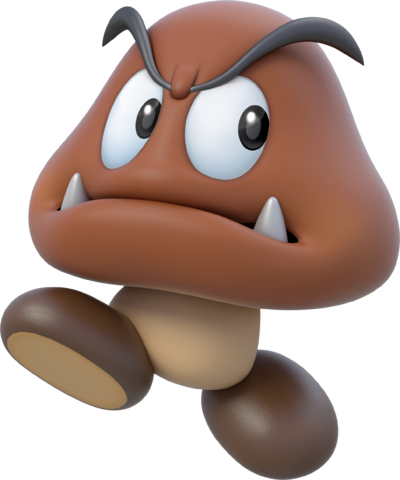 Yes, this is probably the most dangerous goomba in the entire series, statistically the enemy that has killed Mario more than any other enemy in the entire series. Super Mario Bros’s first goomba. Destroyer of Worlds. While this first guy can be murderously difficult for the uninitiated player, it gives a whole lot of extra lives right at the beginning to make sure the player can self correct in case they fail on this first guy and die a few times. Even an experienced player can be killed by this guy (which is why all of the other games start with the goomba above Mario’s head), too, so the game makes sure small mistakes don’t kill the player off. However, if you get hit, you die. There’s wiggle room, but not a lot. Right here, it shows that the game is going to focus on avoiding obstacles and that combat can be deadly. However, it also does a good job of teaching the player to not die. 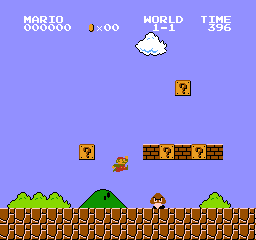 That first question block has a good trajectory, allowing the player to land on, and squash the goomba, if they go for the coin at the right time. The music is moving at the right pace, that if the player jumps right as the music jumps up an octave, they’re also likely to squash the goomba too. Then of course, one of the question blocks has the Super Mushroom, which makes the player big, there are coins, and blocks and all of it works together to teach the player nearly everything they need to play the game right there. Well, almost everything. Most things can be dealt with by jumping on, or over, and the player can pick up an extra hit if they grab a power up, but there’s more to the game than this. Which is why the first level also includes nearly all of the other enemies, other than hammer brothers (very difficult, and a new player won’t have the skills to deal with them right off the bat), and spineys and buzzy beetles (which are just advanced versions of green koopa troopas), and every type of power up, to make sure the player understand how to play the entire game. World 1-1 makes sure the player gets nearly all of the skills they need to play the game before the level ends. It manages to have a comfortable difficulty curve, and introduce the player to a lot of concepts early on to make sure they can get through everything. Interesting, all of World 1 does this, introducing new mechanics and ideas to the player to make sure they can deal with the weirdness of the next few levels. In a lot of ways, World 1-1 is one of the best intro stages in gaming, but it’s not without its flaws. It’s short, doesn’t cover everything the player probably needs and that first five seconds might be harder than it needs to be. Since the goomba isn’t on the same screen as Mario when the level starts, unlike in say, Super Mario Bros. 3, it’s hard to get a good grasp on how the goomba moves or how to deal with it. Later in the level, where the Fire Flower is, gives the player a better idea of how goombas work, as well as the multiple ways of killing them, which is probably why Mario 3 and later games start with the goombas above the player’s heads. Still, it’s hard to get better than this. This level serves as the basis for an entire genre of scrolling platformers, and without it, the gaming landscape would be a very different place. The level does a good job of teaching the player what they need and how to play, without being too difficult or trying. It has everything, from pits to invincibility stars, to warp pipes and hidden blocks containing 1-ups. It’s got secrets to reward inquisitive players and challenges to reward players for being bold, without punishing them for being too bold. In short, it serves as an excellent template for the introduction to a video game, and it allows for the player to go through a tutorial without it being condescending or even feel like it’s a tutorial. Perhaps this is why gamers get so upset with “forced tutorials.” A topic I’ll be exploring at length later.